What are the conditions under which a biological parent should lose rights to their children, and how much should marriage matter in determining that? Does it make a difference whether the child is eligible for enrollment in Native nation or not? And, finally, should the court consider the best interests of the child in determining placement? These I think are the significant points of disagreement between me and those who have argued that it is a feminist position to defend Matt and Melanie Capobianco’s right to adopt Veronica. I would argue that the Baby Veronica case is not a “birthmother’s rights” issue, that birth mothers’ preferences should not always be determinative in disputed stranger adoptions. Several things have happened since I wrote my post that should be updated. First, of course, the Supreme Court found that ICWA did not apply in this case. In my previous post, I made an argument about why I thought that it should. That point is now mooted, as the law is whatever the Supreme Court says it is, unless Congress changes it. The biological father, Dusten Brown’s parental rights were terminated by the finding that ICWA did not apply, and the fact that the would-be adoptive parents live in South Carolina, a state that for purposes of adoption does not recognize men as fathers unless they are married to the mother or meet other stringent criteria (although if an unmarried mother seeks TANF—welfare—in order to keep her child, the state will recognize him as a father, force him to pay child support, and deduct his presumed contribution from her eligibility for benefits. But I digress. The state is not required to treat families trying to keep their children fairly.) I would disagree with those who have suggested that treating fathers as parents was an “unintended” consequence of ICWA, but those who want to know more about the history of ICWA can look to my book, Somebody’s Children, which details both the decade-long fight for its passage and the long history subsequently of it being misunderstood and more often ignored than enforced. Suffice to say that 35 years after ICWA passed, the rate of Native kids being placed in adoptions and foster care is still more than double that of kids from other groups. That should raise political questions about whether the courts should be placing any limitations on the scope of ICWA. Many legal experts and Native advocacy groups expected that when the Supreme Court remanded the case to South Carolina this summer, there would be a hearing on Veronica’s best interest. The SC court had previously applied a “best interest” standard when it denied the Capobianco’s petition to adopt her and ruled that ICWA applied. There was, however, no new hearing on best interest. Instead, a divided court ruled 3-2 that since Christina Maldonado had relinquished her rights to her daughter, and since Dusten Brown was not legally related to Veronica since he did not materially support her birth mother during pregnancy, there was no impediment to issuing a decree granting an adoption to the Capobiancos. But whether or not that stands up as a legal argument (and we will see what happens), it makes no sense socially or morally to treat the Capobiancos as having a standing in this case that Brown is not entitled to. Before the Supreme Court case, they were legal strangers to her. Veronica’s biological father has been caring for her for the last two years, and taking her from a biological parent who wants her, who seemingly and presumptively has, as the South Carolina Court predicted when granting him custody two years ago, kept her “safe, loved, and cared for,” in favor of the Capobiancos seems to be only about their wealth and privilege. The court’s failure to consider Brown a parent, to simply act as if he had no standing at all in the debate over whether she should be adopted by a couple in South Carolina, precisely exemplifies why I think this case is alarming, and why ICWA was passed in the first place. It was one thing to make that argument when she was living with the Copobiancos and had never met Dusten Brown. But it seems quite another two years later, when she has been living with him all this time. He is, quite meaningfully, a parent to Veronica. Supporters of the Capobiancos continue to argue about what happened during Maldonado’s pregnancy, but at this point, that’s a little disingenuous. Maldonado’s lawyer, weirdly, harangued Brown’s supporters after midnight on Facebook a few weeks ago, painting him as your basic deadbeat ex- who abandoned his pregnant girlfriend and turned up again later like a bad penny. Indian Country Today (which has otherwise had really exemplary coverage) described her as a bad mother who had lost her other two kids, someone with significant financial problems who had refused financial help from Brown, gotten a lot of money from the Capobiancos, and bought a fancy new SUV. Yuck. I’m more than willing to stipulate that for neither of them was this their finest hour. Nor is anyone asking whether you or I or anyone has to admire them or like them. The only question is whether they ought to be granted the same wide benefit of the doubt that all parents who do not beat or extensively neglect their children are given. As an adoptive parent myself, I feel for the Capobiancos, who grieve a child that they raised for two years but where not able to adopt when they took her to court at 2. It happens sometimes, and it’s hard. But as someone, too, who mourned with my daughter her sense of loss over her birth parents, I wonder what they think is going to happen when Veronica turns 12 and Googles herself. Or even 7, much less 18, 21, 35. For most adoptees, especially older ones like my daughter or Veronica, who will be four in September, adoption is about loss as well as gain. To some extent, that’s because of how we in the U.S. structure it: you can have only one set of legal parents. If the adoption goes through, Veronica will get a new birth certificate; it will be as if Dusten Brown had never existed. My daughter was taken from her birth family at 2, and again at 4, following a finding of abuse. Today, at 25, she remembers that vividly, and her sense of abandonment—even though she was literally taken away in the middle of the night and ripped from her mother’s arms—still haunts her, even though we have a close and loving relationship, and, if pressed, she would say that her “real” parents are the ones who raised her. I don’t know what I would’ve said to her in the face of her longing for her birth family if the facts were different—if she had been safe and well-loved, but I took her because I wanted a child to raise as my own. If that were the case, I sincerely hope and believe I would’ve stepped aside. Every adoption begins with a tragedy, a crisis, someone’s grief, including, often, the child’s. Why would we socially engineer that for no reason except that the Capobiancos want to raise her? In addition to the speculative question of how Veronica will feel as she grows, there is the broader context of adoption, which this case seems to reinforce the worst aspects of. People who lose children to adoption are almost always poor, Black, brown, or Asian (or the teenage daughters, sometimes, of white evangelicals, who have treated adoption sometimes as a position in a culture war, as the Nightlife Christian adoption agency and lawyer Paul Clement seem to have in this case). People who adopt are wealthy, generally from the U.S., Western Europe, Australia, or Israel, and usually but not exclusively white. In short, adoption follows gradients of power, wealth, and privilege. In the 1950s and sixties, those who relinquished children for adoption were generally young, dependent white girls (other groups’ children were generally considered un-adoptable). In the early 1970s, as soon as white girls started to be able to make enough with their own wages to minimally (even miserably) support their children as single parents, they stopped placing their infants for adoption. Since then, the faces of those placing children for adoption has gotten darker and poorer, are more often from the global South, and those adopting have gotten wealthier. As international human rights treaties have demanded more transparency in where those Guatemalan and other overseas children have come from, or given their birth parents more rights to contest those adoptions, the “supply” of these children, too, has begun to dry up (and as political events make adoption an issue). The whole edifice of adoption as a massive, rather than occasional, practice has relied on finding more and more powerless people to provide adoptable babies and children. It is a mistake, I think, for feminists to look to a dispute between a working-class father in the military and an impoverished and desperate mother and say, let’s take up this woman’s particular cause and call it a women’s rights question. Because overwhelmingly, the people who suffer when it is easy for wealthy strangers to adopt and difficult for birth parents to mount an effective legal challenge are women. In the original fight for ICWA in the sixties and 70s, it was birth mothers who had lost their children who provided the testimony that made Congress initially take notice of the crisis of people taking children from Indian Country. It has been birth mothers—and adoptees—who have campaigned for open records and greater legal protection from would-be adopters. This is not an anti-feminist “father’s rights” case. This is a case about whether poor people of color are going to have meaningful protection of their rights as parents. The “Baby Veronica” case (Adoptive Couple v. Baby Girl) currently before the Supreme Court is many things—a case that could undermine a great deal of federal Indian law by attacking the Indian Child Welfare Act (ICWA); a story about the stupid, mean things a couple will do to each other when they break up; and a sad story about a little kid who, at four, spent the first two years of her life with would-be adoptive parents and the next two living with her bio-father, his wife and other children. It’s also a story about the conservative right’s uses of marriage and its adoption crusade. What it’s not is a case that feminists have been on the right side of. First, the facts, which have been widely misreported. In December 2008, Dusten Brown and Christina Maldonado were engaged; in January 2009, she became pregnant. She lived in his hometown, Bartlesville, OK, near his parents, but as he was active duty military, he lived four hours away at Fort Sill. On learning of her pregnancy, he began to press her to marry; she refused, and in May, they broke up. In an effort to get her to reconsider, he said, he refused to support her and said he wouldn’t pay child support, either. She told him he would have to relinquish his parental rights to her. Meanwhile, without his knowledge, she contacted the Nightlife Christian Adoption Agency (yes, you have heard of them—George Bush publically thanked them for pioneering “snowflake adoptions” of cryopreserved embryos, which they call “pre-born children”). With Nightlife’s assistance, Maldonado selected a couple in South Carolina to adopt her child, a state (not incidentally) that has laws very unfavorable to birth fathers—in order to have standing in an adoption case, fathers must have lived with the birth mother for at least six months prior to the birth of the child, and to have provided financial support, neither of which Brown had done. There was, however, a potential complication, as Maldonado told Nightlife: Brown was Cherokee, which might have made the venue for any adoption Cherokee tribal court in Oklahoma, not South Carolina. Nightlife contacted the Cherokee Nation, but the agency misspelled Brown’s name and gave a wrong birth date for him. As a result, the Nation could not verify that Brown was Cherokee or that the baby was eligible for enrollment, and did not block the removal of the case to South Carolina. Baby Veronica was born in September with the would-be adoptive parents—the Capobiancos—present, but Maldonado told the hospital to deny she was there if Brown called. Four months later, less than two weeks before Brown was to be deployed to Iraq, the Capobiancos’ lawyer sent a process server with relinquishment papers. Thinking he was relinquishing to Maldonado during his deployment, Brown signed a form entitled “Acceptance of Service” but immediately asked for the paper back, saying he wanted to talk to an attorney. The process server threatened him with criminal prosecution if he touched the paper. Brown consulted an army attorney, and filed a stay of the adoption in South Carolina, establishing paternity, seeking custody (offering to place the baby with his parents until he returned from Iraq), and promised to support Veronica. The Cherokee Nation also intervened, identifying the father as a registered member and saying that ICWA applied and had not been followed. Adoption proceedings were halted, although the baby stayed with the Capobiancos. 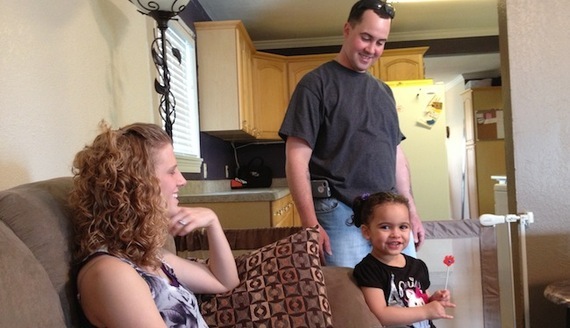 When Brown returned from Iraq in 2011, two South Carolina courts found that ICWA applied, that Brown had not consented to the termination of his parental rights and there never should have been an adoption case, and awarded custody of two-year old Veronica to Brown. At that point, the Capobiancos and Nightlife got considerable attention from the Evangelical Christian right, and “Save Baby Veronica” websites and petitions popped up all over. Enter Paul Clement, patron saint of conservative causes at the Supreme Court–defender of the Defense of Marriage Act, leading the charge against Obama’s expansion of health care coverage, staunch defender of Arizona’s immigration law, and the mouthpiece of the Bush administration in torture cases. Clement also currently represents a non-Indian gaming client who wants to put a casino in New Bedford, Massachusetts, and is arguing that the state law on Indian gaming amounts to an illegal racial set-aside. This may be the real key to the Baby Veronica case—if conservatives are successful in gutting ICWA, much Indian law will also fall. Not for the first time in U.S. history, the successful claim by Native people on a resource—the lucrative gaming industry—is under full-scale legal assault. Clement successfully brought the Baby Veronica case to the Supreme Court, making a series of interrelated arguments. First, his brief insists that Brown is not legally or meaningfully a father because he and Maldonado were not married. For me, as a lesbian mother who raised a child in Arizona where I could not adopt her because her other mother and I were not married, this argument terrifies me. Second, he makes an old (and racist) blood quantum argument, saying that the child is “really” Hispanic, because she doesn’t have a sufficient fraction of “Indian blood” to count—a point on which the Cherokee nation begs to differ. Finally, he says, ICWA is a law that gives unfair racial preferences to Native people in adoption and custody cases. In this, he is following Antonin Scalia, the Supreme Court Justice he clerked for. Scalia, commenting on Baby Veronica, said that the most wrenching case he ever decided was Holyfield, where he had to “turn [a] child over to the tribal council,” removing it from a “wealthy rancher” in an ICWA case. This is a strange description of Holyfield. What the Court actually did in Holyfield was determine that the jurisdiction for the adoption would be tribal court, much as it might find that one state rather than another was the proper place to hear an adoption or custody case. In Holyfield, the “wealthy rancher’s” family in fact adopted the children (there were twins); the tribal court found it was in the children’s best interest. This is a crucial point: ICWA does not determine who gets a child. It determines jurisdiction–who gets to decide who gets a child. Jurisdiction matters a lot in adoption. State laws vary widely, and many Sunbelt states (plus Utah), are known as “easy adoption” states where Christian adoption agencies, in particular, often relocate pregnant women because they, and the birth fathers, have few rights there. ICWA is the only federal law that offers birthparents rights in adoption cases, so that enrolled members of Native Nations, at least, have uniform and enforceable rights. The jurisdiction is always tribal court, and the law is consistent. As I have argued elsewhere, ICWA does not provide special “racial entitlements”; it treats (some) American Indians as having a distinct political status conferred by treaty rights. In fact, in 1974, the Supreme Court ruled on this very point. In Morton v. Mancari, the court held that Native people could be treated differently from non-Native people, not because they belonged to a distinct racial group, but because tribal nations are “quasi-political entities” whose status is determined by federal treaty. Being the parent of a child eligible for tribal enrollment is not a “race.” People otherwise identifiable as Native may have children that are not ICWA-eligible because they belong to a non-recognized or terminated tribe (of which there are about 200 in the United States), because of arcane blood quantum requirements, or because they are indigenous but from Latin America, Canada, or Hawaii. Two, all ICWA does is give birth parents rights that many think they should have regardless, and often do. If the Baby Veronica case had been in Massachusetts, for example, Dusten Brown would be treated as a legal parent, and his daughter could not be adopted unless he either relinquished his parental rights or was shown to be unfit—the same standard as ICWA. “Where is the outrage from women’s groups over this issue?” asks a recent blog post on the Christian Alliance for Indian Child Welfare’s website, wondering why feminists are not angry about an unmarried father demanding a say in the placement of a child for adoption. I’d ask the same question, but with opposite intent. So far, the only feminist voices in this debate have been Joan Heifetz Hollinger and Elizabeth Bartholet, who support Paul Clement and Nightlife Christian Adoption Agency in their brief in the case, which argues for a standard some states have invented, that ICWA should only apply when it disrupts an “existing Indian family,” a standard that has been interpreted very narrowly—a married heterosexual couple living on a reservation. Why feminists would think that is a good idea, when 48% of children are born to single mothers, is beyond me. Here’s why feminists should care about this: it’s a racist case designed to gut federal Indian law. It’s a “states rights” case, which should haunt anyone who thinks slavery was a bad thing. It involves a high-profile cast of right-wing actors, from an evangelical Christian adoption agency to lawyer Paul Clement. Making adoption easy and giving birth parents and unwed parents few rights has been a conservative anti-abortion agenda for a long time. It’s time feminists noticed, and opposed it. When unmarried fathers are not really parents, unmarried mothers are vulnerable too, as when Newt Gingrich threatened to take the children of welfare mothers and put them in orphanages. If this case is successful, it would make it much easier for poor people to lose children, including against their will, which mostly affects mothers. Correction August 15: Due to a writing mistake, the paragraph that begins “There was however a potential…” mistakenly said that Veronica stayed with the Maldonados. She didn’t. She stayed with the Capobiancos. Much has happened in this case since I blogged about it last May. Keep up with it at http://Indiancountrytodaymedianetwork.com/ and http://splitfeathers.blogspot.com/, among other.